Dani's health limited her work in 2013 but the following two pieces were completed. One of Dani's grandson's loves Spiderman. So she made this piece as a Christmas present for him. Click picture on the left to see a larger version of the picture. 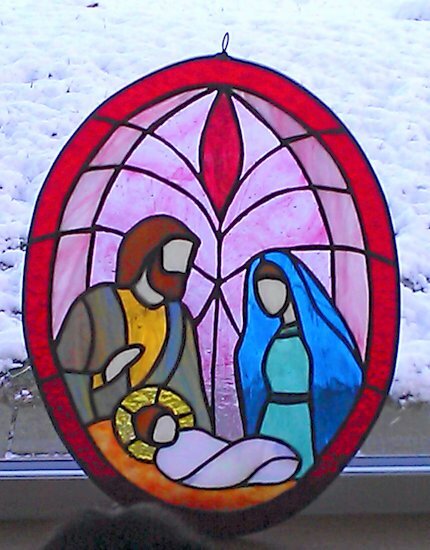 Danielle made this piece to help her family celebrate the birth of their Lord. It frequently is placed under her Christmas tree during the Christmas season. Starting in late 2013, Danielle, whose studio was near Mossyrock, Washington, really got into her stained glass work and taught herself how to work with copper foil. All the pieces on this page are done using this method. She thanks God that her health has improved so much that she was able to do this. Unfortunately, some of these pictures were taken with a cell phone and don't have the greatest quality. 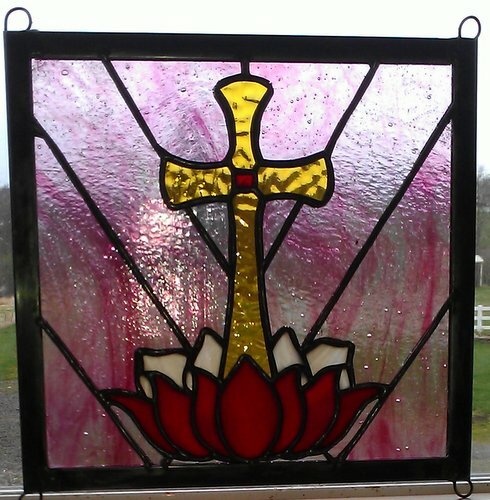 Danielle made this cross to hang in our sanctuary garden. This was a commissioned work for a woman who found the flowers in her mother's Bible. The flowers represent her mother's four children. 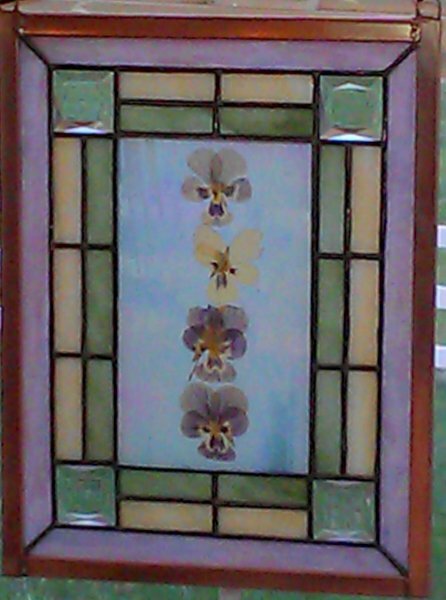 It is a very unusual piece because the flowers are enclosed between two panes of glass. P.S. The woman liked her piece so much that she order three replicas for her children. Only this time the pansies are glass. The colors were picked to compliment the children's homes. 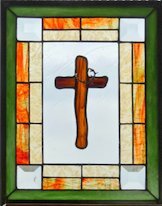 She also commissioned this cross for a half sister. This commissioned work is a western view of Mt. Hood. It is done with copper foil and includes copper wire trees on either side. It measures 24 inches by 18 inches. Two views are shown because it can look quite different with different lighting conditions. Danielle wrote this about this piece: "My mother-in-law, Helen Brink, was a wonderful woman who never ceased to love me. 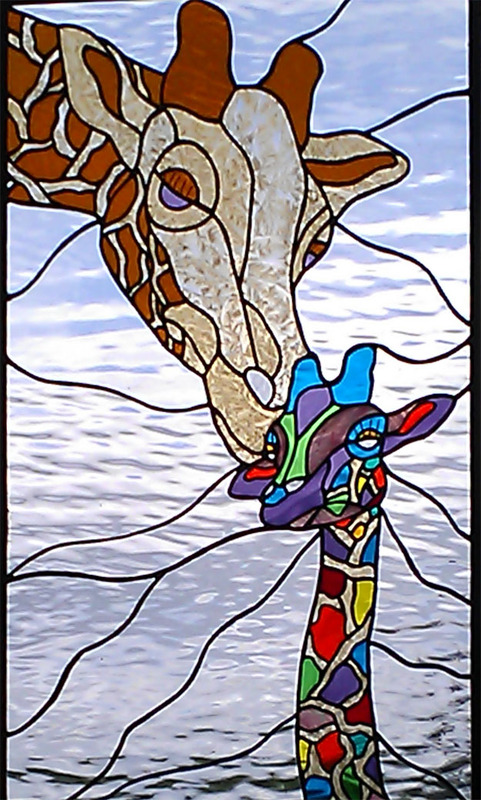 I was reminded recently about her love of birds and that, were she alive, would with pleasure have my glass art in her home. I felt a bird coming on. So, this barn swallowtail is in honor and memory of this amazing woman that I love and miss very much." This fairy panel is a commission piece. The fairy colors are representative of the young woman receiving this panel since she is its inspiration. It also includes a copper bracelet set with an oval blue topaz, her birthstone. 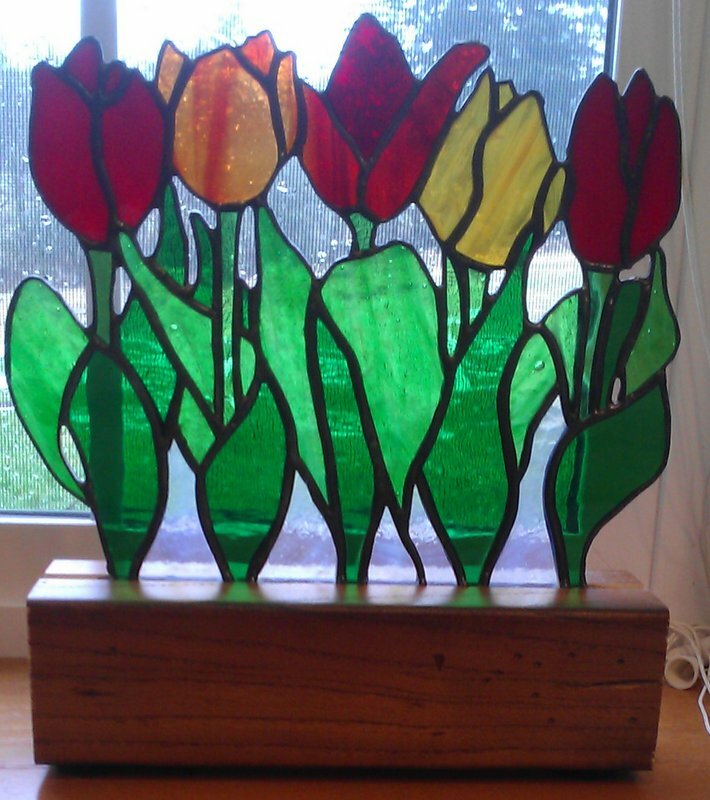 These are the first two of six or more tulip pieces she has been asked to do. The first was a commisioned item. The second is a donation to a silent auction to benefit a niece and 2 of her sons who have type 1 diabetes. (Click either picture to see a larger version of it.) The original tulip piece . Danielle made this Seattle Mariners Emblem as a gift for her husband. 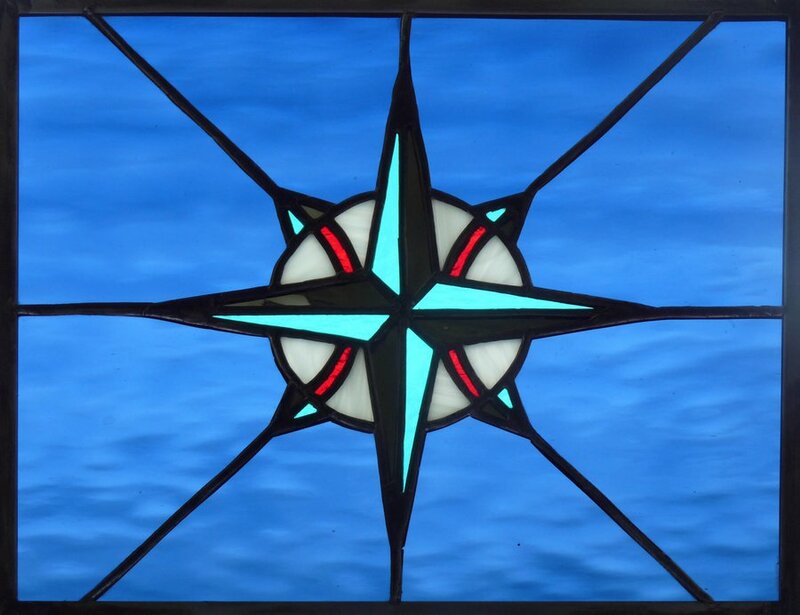 This piece needed to be back lit but there was no appropriate window space so her husband decided to experiment with a light box using a LED light source. Below left is the result. The colors are pretty good at least on his computer. Actually the teal is more accurate than in the view on the left. The pictures below right show the interior of the box. The upper one shows the vellum defectors that help spread the light. There is another sheet of vellum attached to the back of the stained glass piece that acts as a diffuser. The lower one shows the LEDs. This particular light strip is warm white. Perhaps a cool white strip would have been better choice. The person who commisioned this is giving it to her father-in-law who loves hummingbirds. This is one of three additional swallows that were commissioned by a sister-in-law and her daughter that are copies of the swallow Danielle built in honor of her mother-in-law. This is major original piece that Faith commissioned. Danielle believes it is one of her best. It measures 35 inches wide and 9 inches high and is designed to fit in the transom above Faith's front door. There are lots of small pieces of glass in the window. Each of the 198 pieces had to be cut and wrapped in copper foil before the work was assembled and soldered. As always, trying to get a photograph to show its beauty is extremely difficult. The blue in the background is actually blue sky that shows through the pale pink water glass. The border which might appear to be a wood frame is actually dark amber glass that is quite bright when light shows through it. When the picture was taken, it was setting on the stand you see in the bottom cener. Click on the picture to see a larger view of the window (102KB) You can click here for an even larger view (143K) but it may be larger than your monitor can display. The monkey was a semi-original design, commissioned work for the friend's new great-grandson. Can you find his name hidden on the guitar? 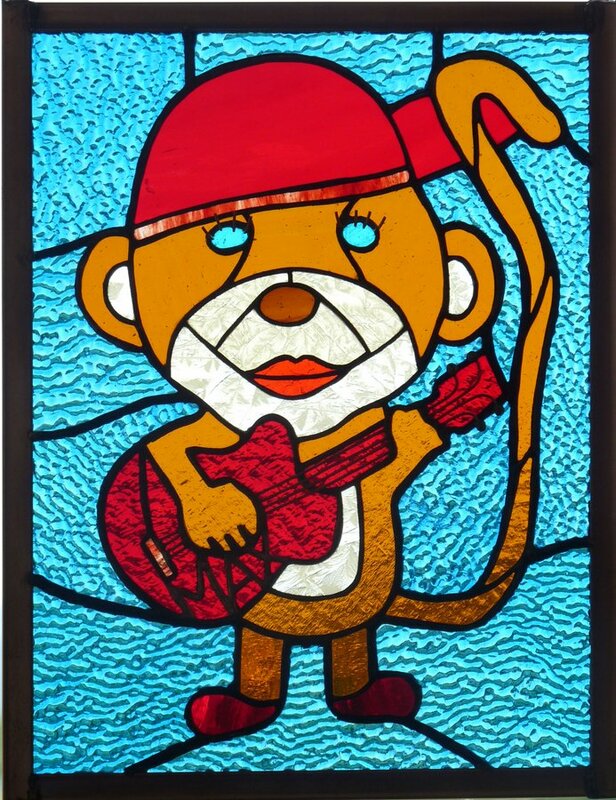 The guitar strings and eye lashes are copper wire.